OMG it's our last chance for BSG spoilers. (Apart from the "Plan" TV movie, which barely counts.) Here's a round-up of spoilery stuff from the media. Be warned, though. This is likely to be a one-way trip to major spoiler-hood. Those who do not wish to be spoiled should scroll past the BSG section now. Ron Moore tells the Wall Street Journal, "I was never tempted to make the ending very nihilistic and kill everyone, but Eddie [James Olmos] wanted to." The L.A. Times says we learn whether BSG is our past or our future - and the answer is "all this has happened before, etc." We see what a cute couple Lee and Kara are, and Saul and Ellen are alternately resolute and frisky. Admiral Adama stages an awesome do-or-die rescue mission, and even smiles a couple times, mostly in flashbacks. Laura Roslin's opera-house vision is explained, and old treachery "paid back in full." Everybody gets to be a hero at some point, including Cavil and Boomer. There's even an explanation for Six's red dress. Oh, and there's lots of pole-dancing. The Boston Herald calls tonight's finale "wildly uneven." The first hour is jam-packed with some of the most exciting action sequences consigned to film. "It's the dying ship [Galactica]'s finest hour." There are deaths, redemptions, reunions and one surprising suicide. And lots more flashbacks that flesh out the characters. "One longstanding dream is finally explained." (I think the opera house thing?) And a romantic moment between Caprica Six and Baltar is interrupted by "the last two people they ever expected to see." The notes from the original BSG theme (from the 1970s) play at one of the episode's most heartbreaking moments. But unfortunately, the Baltar-Jesus cult, with his army of female followers, "turns feverish" tonight, and it's really obnoxious. Adds the Herald's reviewer: "It's as if some assistant photocopying the script mixed in a batch of pages from an old "Touched By An Angel" episode. I won't spoil the denouement, but these last shepherds of humanity make irrational decisions that fly in the face of everything they've struggled for. I must go on record with my unhappiness regarding the resolution of the mystery surrounding Kara Thrace (Katee Sackhoff). She deserved better and so did we. Hera's grand destiny, on the other hand, seems to be much ado about hooey." Says the New York Daily News, "The finale has the crew members hurtling into an asteroid field on the outskirts of a black hole, where the army of their Cylon enemies is waiting to wipe them out in a battle that blows through a season's worth of special-effects money." Real-life astronaut Garrett Weisman tells MSNBC he has a small role as a colonial marine in tonight's episode, which may or may not have gotten cut out. Someone throws up on him, and then he dies. 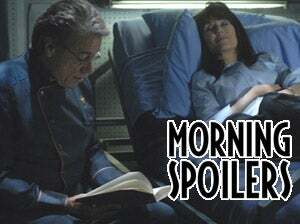 Okay, this is the end of the BSG spoilers. Safe for the rest of you to start reading again. Then there's an attack sequence, where Star Wars-esque submersible vehicles attack Cobra's undersea base. Oh, and a bit of rumor control: I've seen a ton of blogs claiming that Alpha (Alan Tudkyk) appears in tonight's episode. Following the chain of links and trackbacks, it all seems to go back to our own post, where we had the image of Alpha in his lair. But I'm pretty sure we didn't claim that Alpha would be turning up this week, so someone seems to have gotten their wires crossed in a game of telephone. Er... I mean Internet. 5x13, "Some Like It Hoth." Suspicions about a possible breach intensify after Ben is taken from the infirmary, and a reluctant Miles is forced to work with Hurley when he's asked to deliver an important package to a top Dharma official. The love polygon lives. Sawyer and Juliet appear to be settled down, domestic and altogether fuzzy-wuzzy, but they have some struggles ahead. And don't forget, as Sawyer announced in season one, "It's about bunnies," and the newly released Geronimo Jackson album cover agrees with him. And you know what bunnies like to do, right?